All Out Call Out Dyno Day The Dyno Edge and The All Out Call Out are throwing a dyno drag day to kick off the weekend festivities. Come on out to measure your car's horsepower to the wheels. Spectator admission is free but $60 for 2 pulls. All Out Call Out Test and Tune Time to get that car dialed in for the Yearwood Performance Center's All Out Call Out the next day. 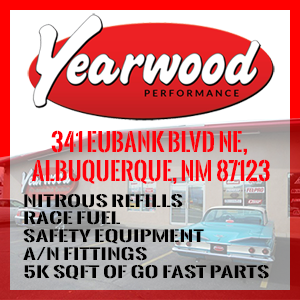 After the Dyno Drags, head on out to the Albuquerque Dragway for some Test and Tune. Gates open at 6pm and they will run the cars pretty late as long as there is a good amount there. $25 to race, $10 to spectate. Mandatory Check In - Tech ALL RACERS must show up for check-in and registration at 12pm. DO NOT BE LATE! From there we will do check in, tech, and the first round of call outs before doing the mandatory drive. Mandatory DriveALL RACERS will make a drive after call outs are finished from the track. From there we will run certain class test hits until 5:00 PM. 2018 All out Call Out Race Start At 5 pm the single eliminations will begin for all classes of the southwest's largest streetcar race. We will start out with our national anthem. After a few rounds of eliminations, we have grudge races (If time is allowed) and some exhibition races as well. There will be plenty of food and vendors on hand and take a stroll in the pits to see your favorite cars. 1320 Video will be on hand as well as the All Out Call Out staff selling merchandise. 2019 NM Deserfest For the 6th year in a row, the All Out Call Out and NM Desertfest has teamed up to bring you the best and the largest car show in the Southwest. Entry is free for spectators but if you want to enter your ride in the show, please visit NM Desertfest's website. There will be prizes, giveaways, and merchandise for sale.